This novella won the 2018 Shirley Jackson award for Best Novella and was nominated for the 2017 Lambda Award. It’s good to know I’m not the only one who believes this novella is brilliant. I’ve never read anything like it. 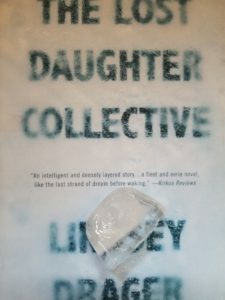 The Lost Daughter Collective interrogates the complex relationship and psychology between fathers and daughters as well as the morals of storytelling, how stories deceive, fade, evolve, teach caution. It’s one of those stories that simply must be read, for it is impossible to describe its experience. The reading of it is like severing off your hand, placing a piece of ice in it, and watching it melt, all the while feeling this dim little pain. The prose is crystalline. The craft, embroidery. The twists are subtle and stunning. This novella is an alien, one I will return to again and again. I’ve got my eye on this young lady, and am very much looking forward to Drager’s novel, The Archive of Alternate Endings, coming out May 7, 2019 from Dzanc.